Let’s plan for a meeting! Sounds familiar? The phrase has become the universal response to most of the organizational issues. Not getting the idea how to implement? Let’s plan a meeting. Want to share your ideas for a project? Let’s plan a meeting. And after all, scheduling a meeting comes out to be the unbeatable solution for many situations. But you never if it is always the best. Sometimes the result of the meeting comes out to be disastrous, and what could be more disastrous than spending your valuable time in insignificant meetings. 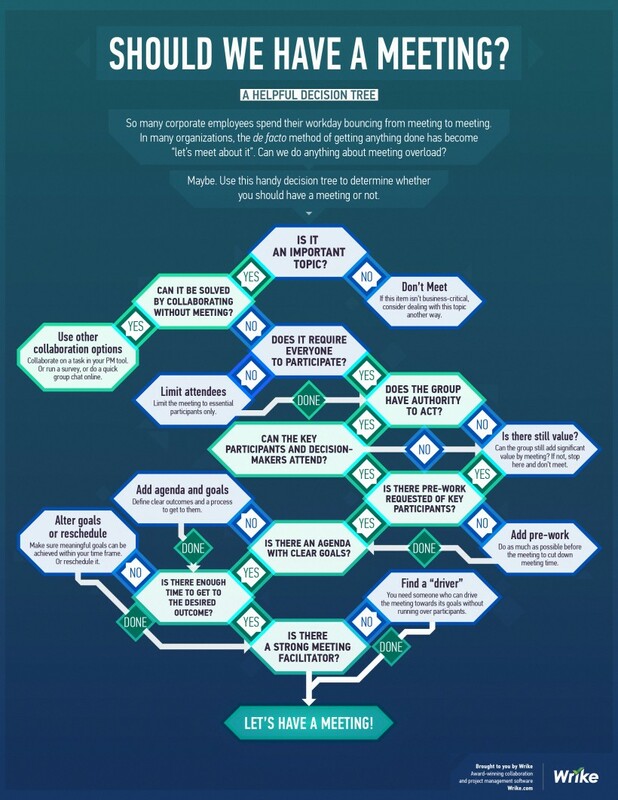 So here’s the decision tree helping you out if this meeting makes you any SENSE! Is the Topic Worth Discussing? Firstly figure out yourself if the topic really needs collaboration with other employees. If YES what are other effective ways to get the project done in less time with maximum output? If NO, deal with the topic another way. Do Everyone in the Office Needs to Participate? Employees feel more connected when they are equally valued. But do this meeting demand you to invite all the co-workers? If NO, limit the meeting to necessary players only. If YES, evaluate that do group members have the authority to act. But if group members are not allowed to react, do they still add a meaning to the meeting? If No don’t proceed further. Can the Key Contributors and the Decision Makers Attend the Meeting? Ask yourself if contributors and the decision makers are allowed to talk back under any circumstances, if no then do this meeting holds any value, obviously NO. On the other hand, if they are free to answer, is there any requirement of their pre works to be displayed? Necessarily YES! Just keep a check if their works exhibit a clear goal. If yes, figure out if there is enough time to get the results done. Even if their goals didn’t determine the exact goals, plan a few, alter some and frame a meaningful intention within your time limit. Is There Someone who can Co-ordinate the Meeting? Now that you have come up with the ideas, added the pre-work and modified the desired outcome, do you have someone to facilitate the meeting? If no, find someone who can conduct the meeting in a successful manner without overreaching the participants.